Here you will create the layout for the project and add elements to it, such as text, background color, reports, images, and a target frame for the drill-down output. You will also customize the parameters and rearrange the items in your layout. For the report (which you will create directly from the layout), you will add calculated values, Where statements to limit the data in the report, and drill-down capabilities. You will also style the report with color, borders, and a page heading. 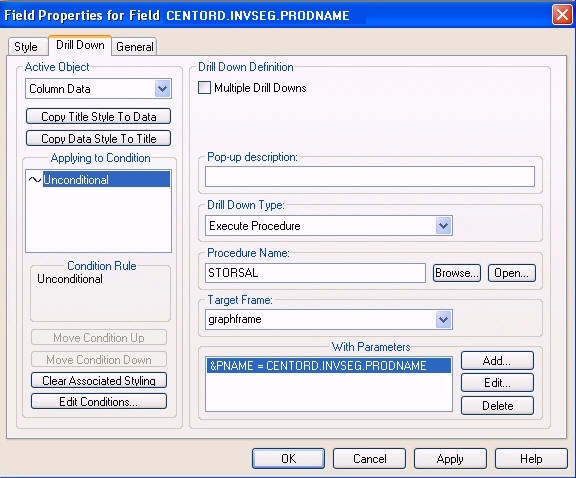 Complete the following steps to create a Layout procedure called PRODREP. 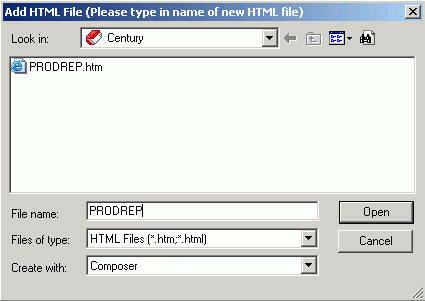 Right-click the HTML Files folder under the Century project. Select New, then select HTML File from the context menus. The Add HTML dialog box opens. Type PRODREP in the File name text box. Note: Composer is selected as the default. 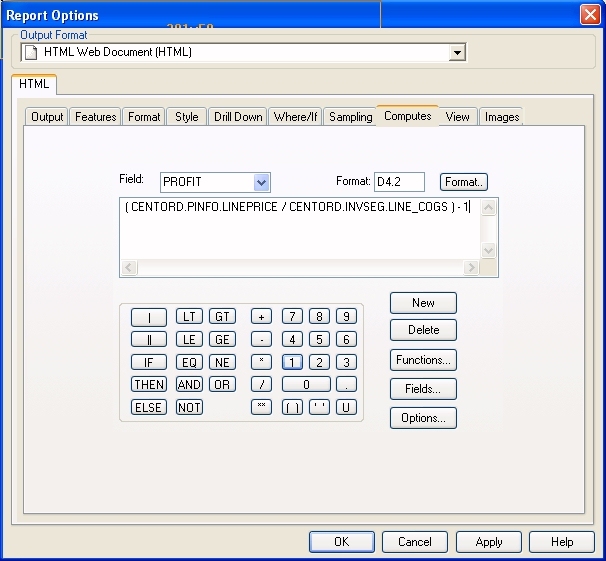 HTML Composer opens, as shown in the following image. Add a heading to your application, style the heading, and add a background color. Click the Insert Text button . Your mouse pointer will change to crosshairs. Drag the crosshairs to create a rectangular text box. You can resize the box after you enter and style the text. 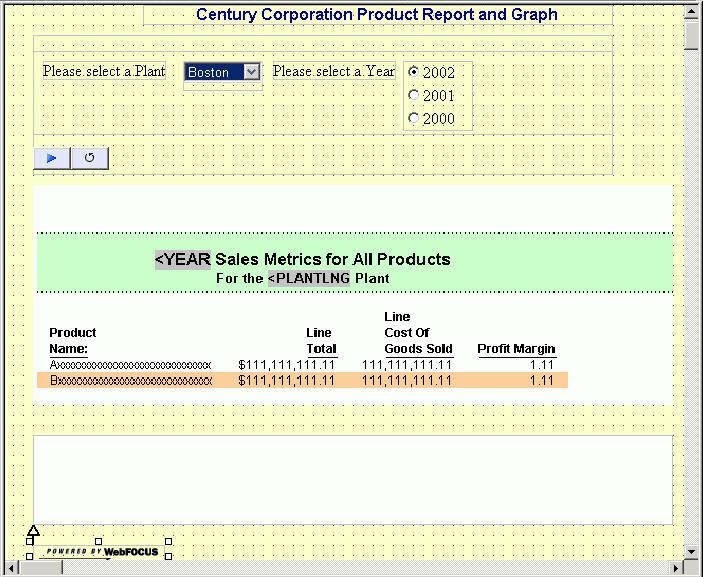 Click on the box and type Century Corporation Report and Graph. Click anywhere outside of the heading text box, then right-click the text box and select Style from the context menu. The Style Composer dialog box opens with Font highlighted in the list at the far left. To set the font type, in the Font name area, select the Family option, then click the ellipsis button to the right. The Font Picker dialog box opens, select Arial in the Installed fonts area, click the right arrow to move Arial to the Selected fonts area, and click OK.
To set the font style, select Bold from the Absolute drop-down list in the Bold area. To set the font size, in the Size area, select px from the Specific drop-down list and type 16 in the input area to the left. To set the font color, select Navy from the Color drop-down list in the Font attributes area. To set the text alignment, select Text below Background in the list at the far left, then select Centered from the Horizontal drop-down list in the Alignment area. This centers the heading text horizontally within the text box. To set the heading background color, select Background below Font in the list at the far left, then select the Transparent option below the Background color menu. This allows the light color you will select for the background color to show through the heading. Click OK to close the Style Composer. Resize the heading text box as necessary by clicking and dragging the borders. To set the background color for the HTML page, select BODY from the top drop-down list in the Properties tab of the Properties bar. Click once in the empty field to the right of Background color, then click the ellipsis button that appears at the far right of the empty field. The Color Picker dialog box opens. Select any light color and click OK. The following image shows how HTML Composer should appear at this point, depending on the size of your text box. You will now create the report in Report Painter which is accessed directly from HTML Composer. The mouse pointer changes to crosshairs. Drag the crosshairs and create a report area placeholder. Note: You can resize and reposition the report placeholder at any time. Select the CENTORD Master File and click Ok. Note: To change the Object Inspector to Field Tree view, right-click in the Object Inspector and select Show Field Tree. Select the Product Name field and click the By button on the toolbar. This sorts all of the data vertically by product name. Select the Line Total column and click the Sum button. This sums the data in the Line Total column. The following image shows how the new report should appear at this point. Continue creating your report by adding a calculated value, called PROFIT. This field is created using a calculation with two existing fields in the CENTORD data source, LINE_PRICE and LINE_COGS. Select Computes from the Report menu, or click the Computes button from the Setup toolbar. 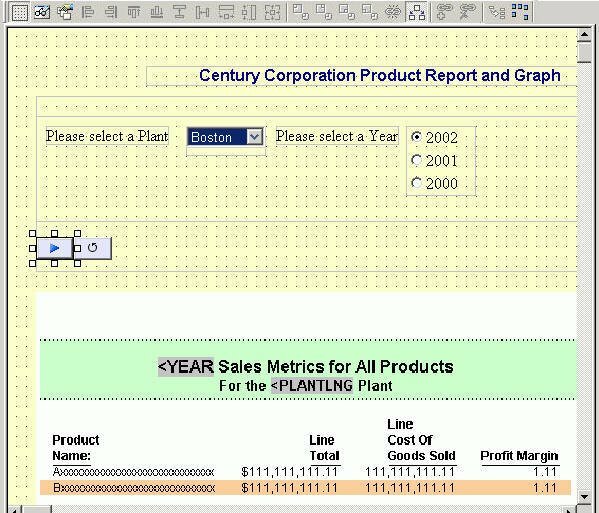 Type PROFIT in the input area labeled Field. Type D4.2 in the input area labeled Format. Tip: In this case, you know the exact format you want for this field. If you are unsure of the format and want to see all available formats, click the Format button to access the Format dialog box. Place the cursor in the box below the input area labeled Field. Create the following expression: (CENTORD.PINFO.LINEPRICE / CENTORD.INVSEG.LINE_COGS) - 1. Double-click LINEPRICE in the CENTORD field list box. Click the forward slash (/) on the Report Options calculator. Double-click LINE_COGS in the CENTORD field list box. Highlight the statement and click the double parentheses ( ). Click the minus (-) sign and then the number 1. The following image shows how the Report Options expression should appear. The new column PROFIT is added to the Report Painter window. Select the PROFIT column and then click the Sum button. Right-click the PROFIT column and select Column Title. Change the title by typing Profit Margin. The following image shows how the report should appear at this point. You will now create a list of acceptable values for the plant location and the year. These are the values the user will be able to select when they are using this application. Later, you will use each set of values you create here to run a parameterized report. To do this, you will need to create two Where statements. Click the Where/If button on the toolbar. From the Fields list, double-click PLANT (under Location Dimension). From the Logical Relation drop-down list, select equals. In the Prompt input field, type Please select a Plant. From the Variable Type drop-down list, select Multiselect OR. In the Data Context area, select Values for field. 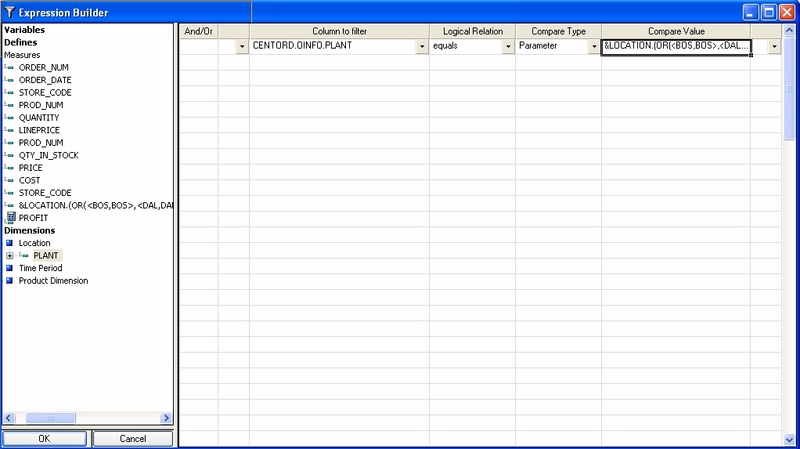 Click the Select a field ellipsis button to get values for the PLANT field. The Value Retrieval dialog box opens. The Value Retrieval dialog box provides a list of available fields in your data source. 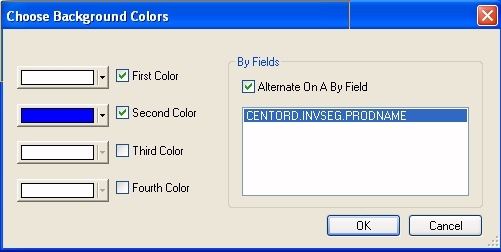 Double-click the PLANT field to close the Value Retrieval dialog box and return to the Variable Editor. 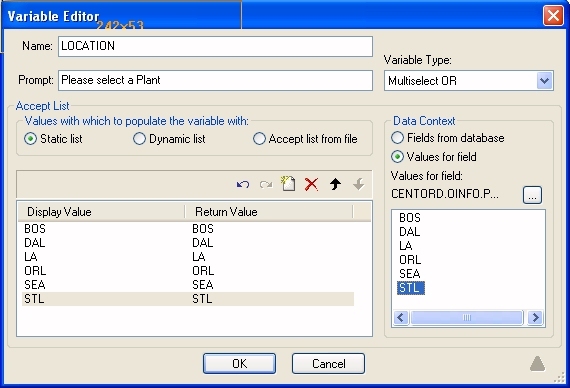 The available values for the PLANT field are listed. Double-click each of the following values (BOS, DAL, LA, ORL, SEA, STL) to add them to the Accept List. The following image shows the Variable Editor populated with the values you selected. The following image shows the Expression Builder populated with the values you selected. From the Fields list, double-click YEAR (under the Time Period Dimension). From the Logical Relations drop-down list select equals. In the Compare Type box select Parameter. Double-click in the Compare Value box to open the Variable Editor. In the Prompt input field, type Please select a Year. Click the Select a field ellipsis button to get values for the YEAR field. The Value Retrieval dialog box opens. The Value Retrieval dialog box provides a list of available fields in your data source. 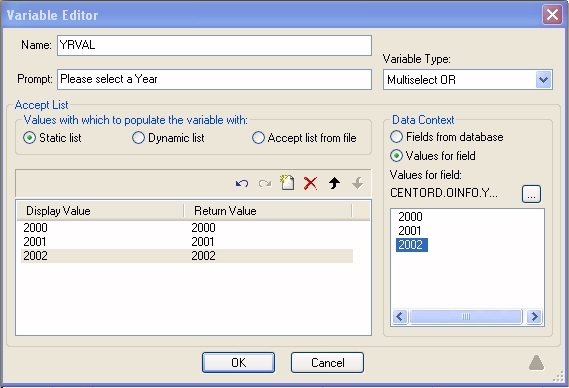 Double-click the YEAR field to close the Value Retrieval dialog box and return to the Variable Editor. The available values for the YEAR field are listed. Double-click each of the following values (2000, 2001, 2002) to add them to the Accept List. Now you will create a page heading for the report. Page headings appear at the top of every report page. In the Report Painter window, click the Page Heading button on the toolbar. Double-click YEAR in the Object Inspector Fields tab. The embedded field <YEAR appears in the Page Heading area. After the <YEAR field, type Sales Metrics for All Products. Type For the followed by one space. Double-click PLANTLNG in the Object Inspector Fields tab. Move the cursor into the Page Heading area after <PLANTLNG and type Plant. Highlight the second line of text in the heading. For font type, select Arial. For font style, select Bold. For font size, select 10. Right-click in the Page Heading area and select Options. The Properties for Page Header dialog box opens. Select the Style tab, then click the Single Color option in the Background Coloring section. Click the Select Colors button and choose a color from the color palette. Click the Justification drop-down list and select Center. Click OK to close the Properties for Page Header dialog box. You will now style the report by adding alternating row colors to the report data and a border around the heading. From the Report menu, select Styling. The following image shows the Report Options dialog box populated with the values you selected. In the Background Color area, select the Alternating Colors option. The Choose Background Colors dialog box opens. Leave the first color as the default selection of white. Select the Second Color check box and select the second color. Select the Alternate On A By Field check box. The following image shows the Choose Background Colors dialog box. Click OK to close the Choose Background Colors dialog box. Click Apply to apply your selection. Leave the Report Options dialog box open to add a border to the heading. In the Report Options dialog box, select Heading from the active object drop-down list. In the Graphical area, click Select Borders. Deselect the Make all borders the same check box. In the Bottom Border area, select the Same as Top Border check box. In the Left Border and Right Border areas, select OFF from the Width drop-down lists. The following image shows the Border dialog box populated with the selected values. Click Apply in the Report Options dialog box, then click OK.
Now you will set up this report so you can drill down from the data in the Product Name column to the STORSAL graph you created earlier. Drill down on the Product Name field, so the information you see in the resulting graph will be specific to that product. In Report Painter, right-click the Product Name column and select Options. In the active object drop-down list, select Column Data. In the Drill Down Type drop-down list, select Execute Procedure. Click the Procedure Name Browse button, select STORSAL.fex from the Open dialog box, and click Open. In the Target Frame area, type graphframe. In the With Parameters area, click Add. Type PNAME in the Parameter Name input box. PNAME is the parameter you created in the STORSAL procedure. In the Parameter value area, select the Field option. 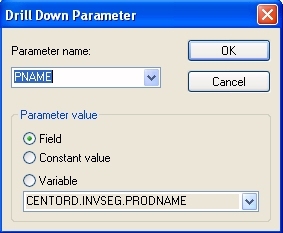 Select the PRODNAME field from the drop-down list in the Parameter value area. Click OK to close the Drill Down Parameter dialog box. The following image shows the Field Properties dialog box populated with the values you selected. You are returned to HTML Composer, and the New Parameters dialog appears. Click OK to automatically add your parameters to the HTML page. The following image shows how HTML Composer should look at this point. You will now customize the Plant (LOCATION) parameter by modifying the value from the data source to make it more user-friendly. You will also change the control type for the Year (YRVAL) parameter from a list box to a radio button, rearrange the order of values, and change the default value. In HTML Composer, select the Parameters tab. The Properties and settings dialog box opens, showing a Legend of the available controls for the parameters on the HTML page. Click the list box control (Input control listbox1) associated with the LOCATION parameter. Change the control type to a drop-down list by right-clicking the LOCATION list box control (Input control listbox1) and select Drop down list from the Set Control Type context menu. This changes the display name in the drop-down list from the value stored in the data source to the values you specify. To make Boston the default selection, click the Boston check box in the Selected column. The following image shows how the LOCATION drop-down list settings should appear. Click the list box control (Input control listbox2) associated with the YRVAL parameter. Change the control type to a Radio button by right-clicking the YRVAL list box control (Input control listbox2) and select Radio button from the Set Control Type context menu. From the Properties and settings dialog box, drag and drop the Year values so they appear in descending order. Select a year and use the up/down arrows above the Static Values area to change the order of the years. To make 2002 the default selection, click the check box in the Selected column for the 2002 value. The following image shows how the YRVAL Radio button settings should appear. Close the Properties and settings dialog box for the YRVAL Radio button. Switch to the Design tab to view the Parameter changes on the HTML page. You will now add an output target frame that will contain the graph output from the main report when a user selects a drill-down link. The frame is invisible to the user until a drill-down link is selected. In HTML Composer from the Insert menu, select Components, then select Frame. Your mouse pointer changes to crosshairs. Scroll down past the report placeholder to insert the frame by dragging the crosshairs to form a rectangular box just below the report area. Click anywhere inside the frame you inserted and view the Properties window. The properties associated with the new frame are displayed in the Properties window. Double-click the iframe1 value in the right column next to Name in the left column of the Properties tab. Replace this value by typing graphframe which is the same Target Name entered in the Drill Down tab. For more information, see How to Set Up the Drill-Down Report. Now you will move some items around in HTML Composer and add an image. 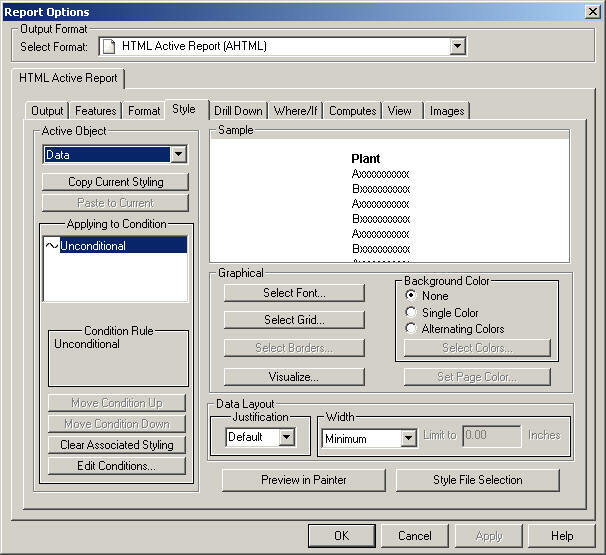 Rearrange the heading, the Please select a Plant prompt and selection box, and the Please select a Year prompt and option buttons so the report page in HTML Composer appears like the following image. Click the new frame and grab the handles to resize it to almost the same size as the report placeholder. This frame will contain graph output when a user clicks a drill-down link in the report. Press the Ctrl key and click the report placeholder and then the frame placeholder. Click the Make same size button. Click the Align right button. Drag the crosshair to create a rectangular image box below the bottom-left corner of the new frame. The powered.gif image is added to your report layout. Pressing the Ctrl key, click the image and then the frame. Click the Relate Bottom Left button. This ensures that the image always appears in relation to the bottom-left corner of the frame, regardless of the size of the frame. The following image shows the completed reporting application. Your report layout will appear somewhat different depending on the size and location of the components you added to the PRODREP.htm file. From the File menu, select Close.